1. The burner should not require secondary air for complete combustion. In other words the burner should be designed so that the correct mixture of air and gas should emerge from the end of the burner so that all the gas is completely burned. This means that the burner hole in the furnace can be a close fit around the burner so that extra cool air is not drawn into the furnace that would reduce the efficiency. 2. The burner should be designed so that streamline flow of gas and air through the burner tube occurs. The header photo shows the finished burner. At the lower left hand side can be seen the propane connection and above this is an elbow stopcock. The other side of the stopcock connects to a 10 mm steel tube that carries the gas orifice. The long tube is the mixing tube. It is a 250 mm long piece of 20 mm OD steel tube. It terminates at the far end with a short piece of 25 mm tube that fits over the end. 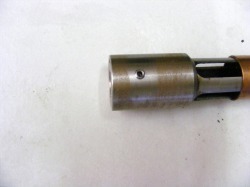 This end piece is turned so that the bore flares from 20 mm diameter to 25 mm diameter. This flare stabilises the flame at the end of the tube. 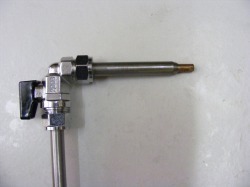 On the left hand side, the tube carrying the gas orifice can slide in the mixing tube in order to optimise the orifice position. Also on the left hand side of the tube can be seen a piece of 22 mm copper tube. This has a 20 mm bore and slides freely on the mixing tube. Under the copper tube are the air inlet slots. This shows the burner orifice and the air admittance slots. This is the area covered by the copper tube in the header photo. On the left is the mixing tube end block. This is a piece of 25 mm diameter bar that was drilled out 10 mm to accept the 10 mm tube carrying the orifice. The block was counter bored for a short distance out to 20 mm diameter and the mixing tube silver soldered to it. In the centre of the photo can be seen the copper burner orifice. There are four air admittance slots equally spaced around the mixing tube each being 8 x 50 mm. This shows the end block in more detail. The gas orifice tube slides into the 10 mm hole through the block and it locked in position with the grub screw. Also note how the copper tube slides to cover the air admittance slots. By adjusting the position of the copper tube the amount of air entering the mixing tube can be varied. 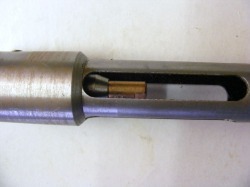 This shows the 10 mm tube carrying the gas orifice. The gas orifice is a 0.6 mm mig welding tip that screws into the end of the 10 mm tube. The threads are sealed with PTFE tape. The burner functions very well. Adjusting it for optimum performance is a bit of an art and Michael Porter gives detailed instructions on how to tell when the air mixture is optimum from the flame characteristics. My experience is that partially burned gas has a rather characteristic odour and I simply adjust the air admittance cover (the sliding copper tube) slowly from the completely closed position until the exit gas from the furnace has little or no smell. I find that the position of the burner orifice has relatively little effect. When working at the optimum position the flame is very hot and if it directly impinges on the refractory then this will melt. It is important therefore that the burner position is adjusted so that the flare just protrudes into the furnace cavity otherwise the refractory around the burner hole is damaged. The flared tube at the end of the burner is suffering a little from the heat. It is only mild steel ( because it was available). I need to machine a new flare some time from stainless steel which would be better at high temperature. Another job on the "to do" list!